If you like aggressive nagare styling and turbo hot hatch power you're going to love the 2010 Mazdaspeed3. If you don't like those things we don't recommend you viewing all the hotness below the jump. As mentioned, the new Mazdaspeed3 gains an aggressive (aggressively happy) new appearance package based on the new 2010 Mazda3, a revised suspension and the same 2.3-liter direct-injection turbocharged fourbanger putting out 265 HP and 280 lb-ft of torque. Why mess with success? 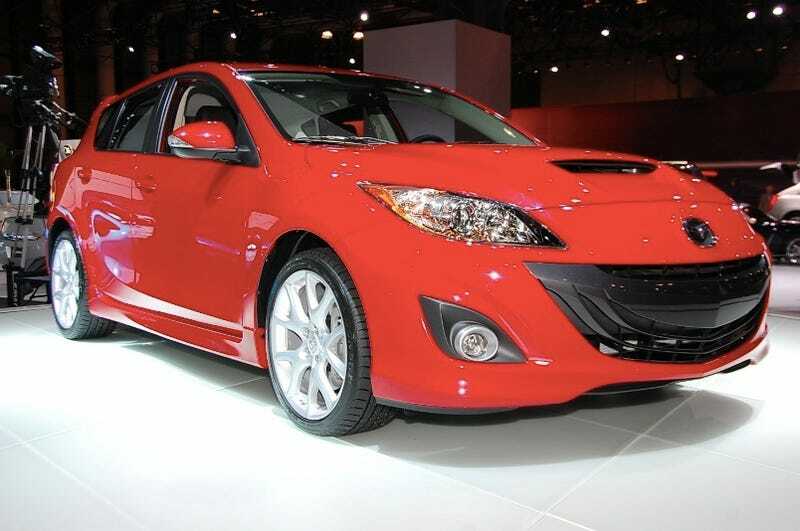 The MAZDASPEED3 is the third model in the 2010 MAZDA3 lineup, joining the MAZDA3 5-door, which made its North American debut at the North American International Auto Show earlier this year, and the 4-door sedan, which made its world debut at the Los Angeles Auto Show last November. Headquartered in Irvine, Calif., Mazda North American Operations oversees the sales, marketing, parts and customer service support of Mazda vehicles in the United States, Canada, Mexico and Puerto Rico through more than 850 dealers. Operations in Canada are managed by Mazda Canada, Inc., located in Ontario, Canada, and in Mexico by Mazda Motor de Mexico in Mexico City.